Did you know that September is National Family Meals Month? Coinciding with the start of the traditional school year, it’s also the perfect time to get your family together around the table. National Family Meals Month is facilitated by FMI Family Meals, a movement to raise awareness of the benefits of frequent family meals. All during the month of September, food retailers across the country will be working collaboratively to bring families back to the table to share one more meal at home per week. So, with schedules as busy as they are, how do we make more time for family meals? Well, one of the key ingredients to helping you make easy and quick family meals, is the amazing variety of products you’ll find when you visit Hormel Foods and the great ideas from their Easy Recipe Ideas site. My own idea for a great family meal is this Ham on Rye Breakfast Sandwich. 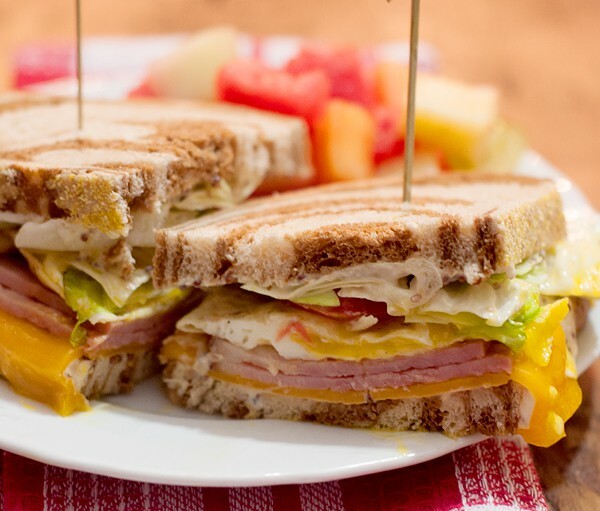 It uses Hormel Cure 81 Classic Dinner Ham along with sharp cheddar cheese and a delicious fried egg to make a delectable option for a family breakfast. 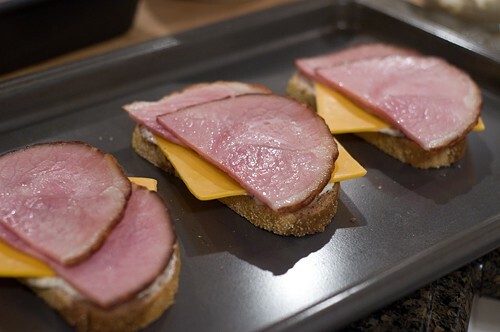 Prepare the ham (according to package instructions) in advance and then assemble the sandwiches in a matter of minutes. I serve this with a healthy side of mixed fresh fruit. Prepare the Hormel Cure 81 Classic Dinner ham according to package directions (may be done a day or two in advance and refrigerated until ready to use). 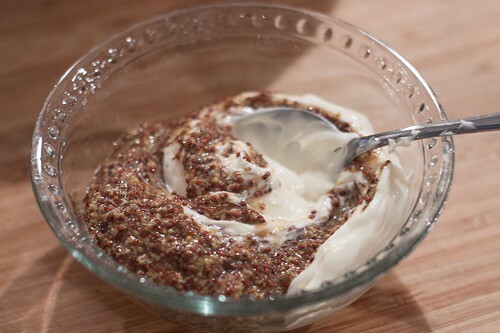 Make the mayo-mustard spread: In a small bowl, combine the mayonnaise and mustard stirring until thoroughly mixed. Fry the eggs: Heat a non-stick skillet over medium heat. Add the olive oil and butter. Break each egg carefully into the pan. Cook until yolk is set as desired. Remove to a plate. Assemble the sandwiches: Heat the oven to 400 degrees. Place 4 slices of the marbled rye bread on a baking sheet and add a generous amount of the mayo-mustard mixture. Top with one slice of sharp cheddar cheese and two slices of Hormel Cure 81 Classic Dinner Ham. Bake until the cheese begins to melt. Remove from the oven and top each with a fried egg, salt, pepper, sliced tomatoes, and lettuce. Top with a second slice of marbled rye generously spread with the mayo-mustard mixture. A hearty breakfast sandwich the whole family will enjoy! * Berge, J. (2015). The protective role of family meals for youth obesity: 10-year longitudinal associations. The Journal of Pediatrics, 166 (2). ** Meier, A. and Musick, K. (2014). Variation in associations between family dinners and adolescent well-being. Journal of Marriage and Family, 76 (1). It was meant to be, Barb. Permission granted! I think it’s very important, too. We always ate as a family when I was a child and we still do it now. I just want to eat this for all of my meals forever and always. This looks great for breakfast, lunch or dinner. I will definitely try this!!! It really is good for any time of day. Hope you like it! That is a beautiful sandwich! The sharp cheddar oozing down the side really makes it. I would happily eat this sandwich for breakfast, lunch AND dinner…seven days a week. No. Really! This is my kind of breakfast! I especially love the rye bread – great flavor pairing with the ham, eggs and cheese! Tis the season for all eating meals together again as a family! This breakfast sandwich is making my mouth water! 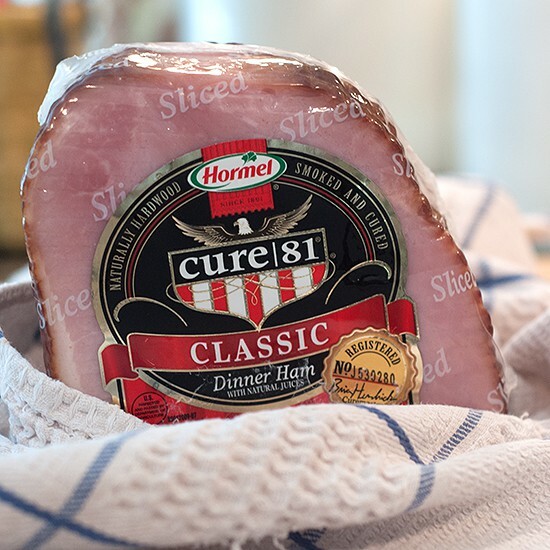 You just can’t beat that Hormel Cure 81 ham. I don’t know the significance of “81” but I know that it’s fabulous. Great new idea. We always ate as a family growing up, I really can’t remember many nights that we didn’t and I think it’s important that families continue to do so. 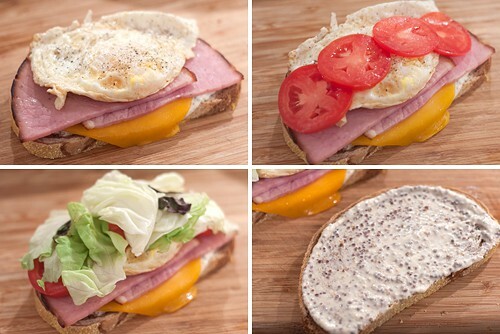 These sandwiches look like the perfect breakfast for dinner and that yolk! Perfection! I love rye bread. It’s so good. Piled high with this amazing ham it’s even better. I’d love to sink my teeth into this gorgeous sandwich. I think it is great there is a month that is focused on bringing the family back around the dinner table! We eat together 5 nights a week and I believe it is the best thing for our family! Love this sandwich! 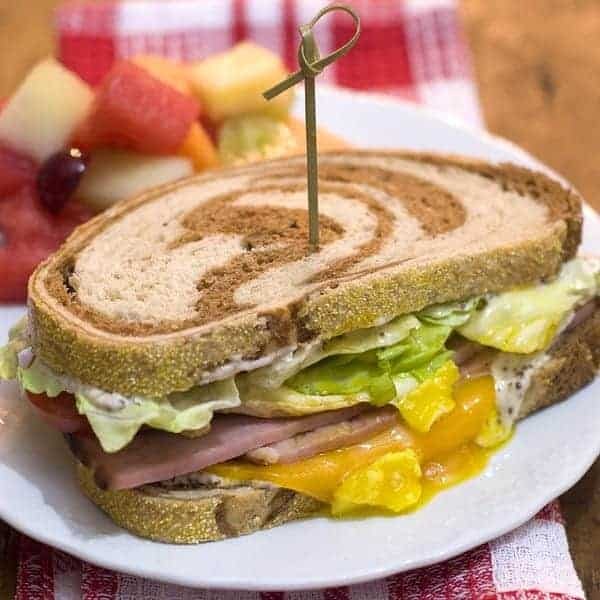 I know it may look pretty simple but putting together the mayo and the mustard like that gives this sandwich a special touch… a lovely combination with that ham!